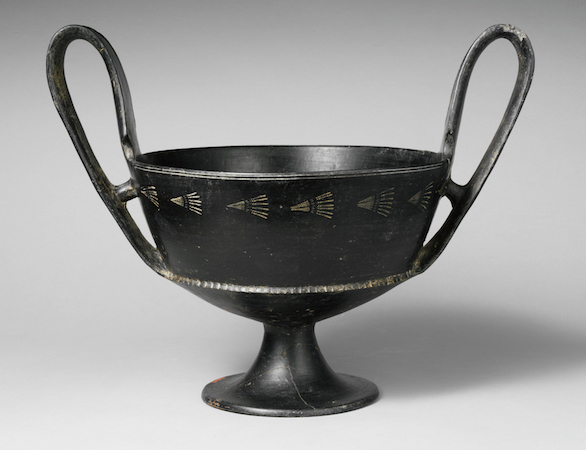 Bucchero, a distinctly black, burnished ceramic ware, is often considered the signature ceramic fabric of the Etruscans, an indigenous, pre-Roman people of the Italian peninsula. The term bucchero derives from the Spanish term búcaro (Portuguese: pucaro), meaning either a ceramic jar or a type of aromatic clay. The main period of bucchero production and use stretches from the seventh to the fifth centuries B.C.E. A tableware made mostly for elite consumption, bucchero pottery occupies a key position in our understanding of Etruscan material culture. Bucchero’s distinctive black color results from its manufacturing process. The pottery is fired in a reducing atmosphere, meaning the amount of oxygen in the kiln’s firing chamber is restricted, resulting in the dark color. The oxygen-starved atmosphere of the kiln causes the iron oxide in the clay to give up its oxygen molecules, making the pottery darken in color. The fact that pottery was burnished (polished by rubbing) before firing creates the high, almost metallic, sheen. This lustrous, black finish is a hallmark of bucchero pottery. Another hallmark is the fine surface of the pottery, which results from the finely levigated (ground) clay used to make bucchero. Bucchero wares may draw their inspiration from metalware vessels, particularly those crafted of silver, that would have been used as elite tablewares. The design of early bucchero ware seems to evoke the lines and crispness of metallic vessels; additionally early decorative patterns that rely on incision and rouletting (roller-stamping) also evoke metalliform design tendencies. Impasto (a rough unrefined clay) ceramics produced by the Villanovan culture (the earliest Iron Age culture of central and northern Italy) were forerunners of Etruscan bucchero forms. Also called buccheroid impasto, they were the product of a kiln environment that allows for a preliminary phase of oxidation but then only a partial reduction, yielding a surface finish that ranges from dark brown to black, but with a section that remains fairly light in color. The kyathos in the Metropolitan Museum of Art (above) provides a good example; the quality of potting is high overall. This impasto ware was thrown on the wheel, has a highly burnished surface, but has a less refined fabric (material) than later examples of true bucchero. Archaeologists have discovered bucchero in Etruria and Latium (modern Tuscany and northern Lazio) in central Italy; it is often frequently found in funereal contexts. Bucchero was also exported, in some cases, as examples have been found in southern France, the Aegean, North Africa, and Egypt. The production of bucchero is typically divided into three artistic phases. These are distinguishable on the basis of the quality and thickness of the fabric. The phases are: “thin-walled bucchero” (bucchero sottile), produced c. 675 to 626 B.C.E., “transitional,” produced c. 625 to 575 B.C.E., and “heavy bucchero” (bucchero pesante), produced from c. 575 to the beginning of the fifth century B.C.E. The earliest bucchero has been discovered in tombs at Caere (just northwest of Rome). Its extremely thin-walled construction and sharp features echo metallic prototypes. Decoration on the earliest examples is usually in the form of geometric incision, including chevrons and other linear motifs (above). Roller stamp methods would later replace the incision. By the sixth century B.C.E., a “heavy” type of the ceramic had replaced the thin-walled bucchero. 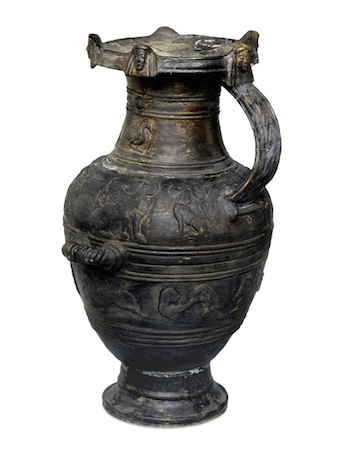 A hydria (vessel used to carry water) in the British Museum (above) is another example of the “heavy” bucchero of the sixth century B.C.E. 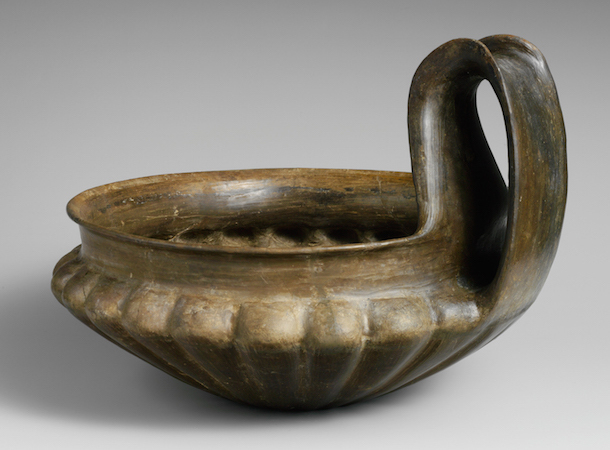 This vessel has a series of female appliqué heads as well as other ornamentation. A tendency of the “heavy” type also included the use of mold-made techniques to create relief decoration. A number of surviving bucchero examples carry incised inscriptions. A bucchero vessel currently in the collection of the Metropolitan Museum of Art (above) provides an example of an abecedarium (the letters of the alphabet) inscribed on a ceramic vessel. 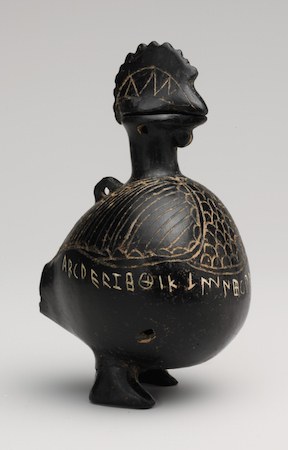 This vase, in the form of a cockerel, dates to the second half of the seventh century B.C.E. 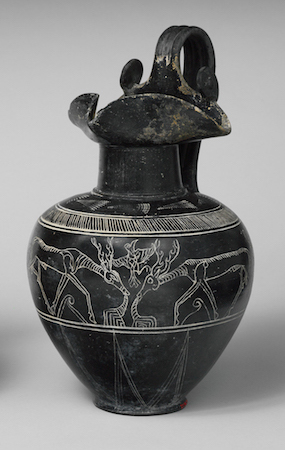 has the 26 letters of the Etruscan alphabet inscribed around its belly (below)—the vase combines practicality (it may have been used as an inkwell) with a touch of whimsy. It demonstrates the penchant of Etruscan potters for incision and the plastic modeling of ceramic forms. 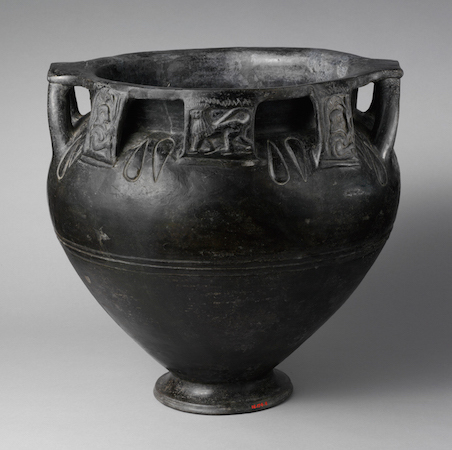 Bucchero pottery represents a key source of information about the Etruscan civilization. 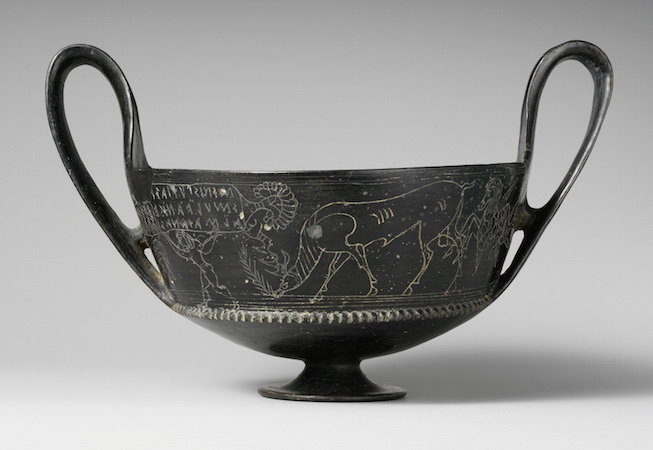 Used by elites at banquets, bucchero demonstrates the tendencies of elite consumption among the Etruscans. The elite display at the banqueting table helped to reinforce social rank and to allow elites to advertise the achievements and status of themselves and their families. Jon M. Berkin, The Orientalizing Bucchero from the Lower Building at Poggio Civitate (Murlo) (Boston: Published for the Archaeological Institute of America by the University of Pennsylvania Museum of Archaeology and Anthropology, 2003). Mauro Cristofani, Le tombe da Monte Michele nel Museo archeologico di Firenze (Florence: Leo S. Olschki, 1969). Richard DePuma, Corpus vasorum antiquorum. [United States of America]. The J. Paul Getty Museum, Malibu: Etruscan Impasto and Bucchero (Corpus vasorum antiquorum., United States of America, fasc. 31: fascim. 6.) (Malibu: The J. Paul Getty Museum, 1996). Richard DePuma, Etruscan Art in the Metropolitan Museum of Art (New York: Metropolitan Museum of Art, 2013). Nancy Hirschland-Ramage, “Studies in Early Etruscan Bucchero,” Papers of the British School at Rome 38 (1970), pp. 1–61. Philip Perkins, Etruscan Bucchero in the British Museum (London: The British Museum, 2007). Tom Rasmussen, Bucchero Pottery from Southern Etruria (Cambridge: Cambridge University Press, 1979). Wim Regter, Imitation and Creation: Development of Early Bucchero Design at Cerveteri in the Seventh Century B.C. (Amsterdam: Allard Pierson Museum, 2003). Margaret Wadsworth, “A Potter’s Experience with the Method of Firing Bucchero,” Opuscula Romana 14 (1983), pp. 65-68. Cite this page as: Dr. Jeffrey A. Becker, "Bucchero," in Smarthistory, August 8, 2015, accessed April 24, 2019, https://smarthistory.org/bucchero/.